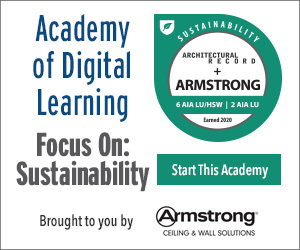 Examine ways in which architects can guide projects to be more sustainable by using reclaimed materials and certification guidelines, such as Living Building Challenge (LBC), to meet those goals. Describe exterior and interior sustainable strategies to increase and maintain building efficiencies over time. Discuss key challenges architects may face in trying to obtain LBC certification and meet other green building standards, and describe potential solutions to meet sustainable building objectives. Explain how low-tech, low-energy, and low-impact materials and building systems can benefit sustainability goals of some structures. These corporate headquarters reflect the company's commitment to employees and the planet. Named in recognition of Tranquility Base, the first human outpost on the moon, the LEED Platinum Sustainability Base was designed to be an economic engine for built-environment technologies leading to independent, smart buildings. Devon Energy Center employs such sustainable strategies as a remediation of a brownfield site, green roofs on the podium, an advanced building-management system, floor-to-ceiling low-E insulated glass with interior shading, and vertical glass fins and horizontal tubes to reduce solar load. Bohlin Cywinski Jackson associate Patricia Culley describes the rigors of designing Pittsburgh’s Frick Environmental Center to meet the highest green building standards. With this modern rammed-earth house, the architect’s aim was to ignite the community’s interest in a sustainable building typology characteristic of the region. Building upon the traditional construction techniques that disappeared during rural migration in the 20th century, the project was inspired by old local earthen buildings, taking cues from their orientations, morphologies, and use of local materials.